It’s funny how past memories can “ backlight” present perceptions. The Great Pyrenees is a huge dog, bred to guard and protect the sheep under his care. The memory of our “gentle giant”, Caleb - a lean 175 lb Great ‘Pyr’ - keeps coming to mind lately. “Don’t get this dog if you beat your children”, our breeder warned us. We laughed and thought nothing of it. Then one day, while wrestling with a stubborn winter boot that had become stuck on our daughter’s foot - with Chara lying on the floor squealing with laughter and Grant tugging valiantly at the recalcitrant boot - Caleb got up from where he had been quietly watching, and, smiling graciously, placed his huge doggy self between Grant and Chara, gently but emphatically separating the two. Grant was not allowed to come near her for the rest of the day. Chara’s amusement at this was surpassed several years later when once again, Caleb intervened - this time in a mock wrestling match between our son, David, and Grant. David’s laughter turned to sheer delight as, in one fluid motion, Caleb rose and effortlessly, in a split second, pinned Grant to the floor, and held him there with his huge, heavy paw, while serenely smiling down at his beloved Grant. This memory kept coming to mind as we met today with Bishop Mouneer, a gentle giant of another sort - and also a guardian of beloved “sheep”. This holy and humble shepherd manages to combine a wicked sense of humour with a depth of compassion and wisdom that few possess. In times of crisis he is able to go to Muslim leaders and ask, “How can we work together for peace?” He is able, with a twinkle in his eye and genuine friendship in his heart, to speak the truth in love without compromise, because of the relationships he has built by grace with care and respect. Pray that we too will have the gift of building ‘relationships of honour’ in Ethiopia and elsewhere in the Horn of Africa. 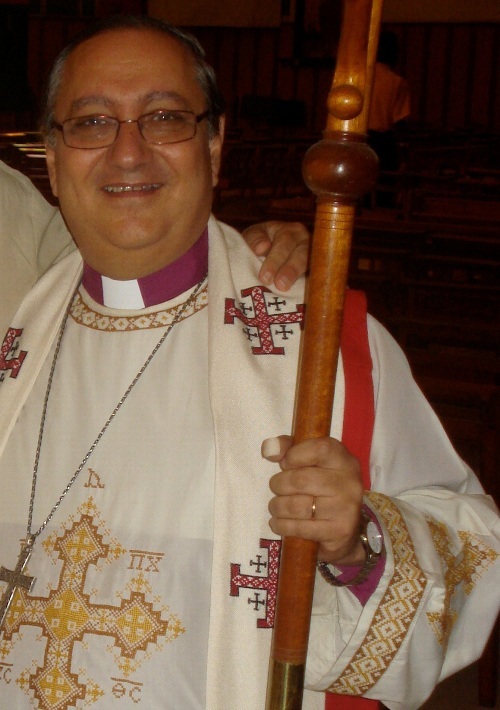 Bishop Mouneer Anis is the diocesan bishop of the Diocese of Egypt with North Africa and the Horn of Africa; the Primate of the Province of Jerusalem and the Middle East; and our boss, our friend, and our mentor. Pray for him as the Diocese continues to grow as a place of Anglican teaching and discipleship throughout the region.